Online reviews can have a direct influence on whether a tenant chooses to rent from you. One study showed that more than seven in ten renters check online reviews, and they're also interested in seeing whether properties make timely replies to complaints and compliments. 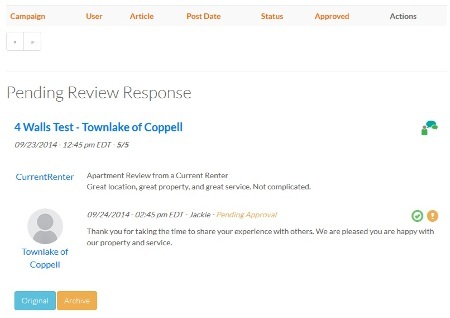 Respage's new Review Response service aims to help the multifamily community respond to reviews. Review Response consists of reputation specialists who will monitor your reviews on sites such as Yelp, Google+ Local, and others on a daily basis; reply to both positive and negative reviews by writing custom responses, which you approve first; and provide detailed reputation reporting through an online dashboard. Review Response rates start at $99 per month. Contact us if you'd like to learn more about the service.